Author-Artist-Scientist Laura Cunningham on "Forgotten Landscapes of California"
For her book, Cunningham spent over 20 years illustrating how California might have looked before the arrival of Europeans. Her artwork often goes back centuries and even millennia (and on a few occasions all the way to the ice age). In recent weeks Laura Cunningham, author and illustrator of A State of Change: Forgotten Landscapes of California, has been speaking in Southern California. This is a report on her appearance at Environment Now in Santa Monica (February 23). For her book, Cunningham spent over 20 years illustrating how California might have looked before the arrival of Europeans. Her artwork often goes back centuries and even millennia (and on a few occasions all the way to the ice age*). Cunningham is also a paleontologist and naturalist. In addition to oil paintings, "State of Change" is full of notes, diagrams, and sketches explaining Cunningham's research. Her interest and curiosity about pre-European California goes back to her early childhood. Living in the East Bay, she wondered what her neighborhood was like centuries earlier. Once Cunningham became a scientist and self-taught painter she was able to take her curiosity to whole new levels. In depicting bears (there is a striking painting in her book of a grizzly overlooking the San Fernando Valley), rather than studying out-of-shape ones in zoos, she visited Yellow Stone National Park. She went to other locales as well since other animals, such as wolves, have become very rare in California or completely absent. Cunningham also consulted indigenous elders and sometimes learned things contrary to what anthropologists and other scientists had stated. She seems to agree with M. Kat Anderson, author of Tending the Wild, about the critical role Native Americans could have in restoring ecosystems. One problem, though, is that indigenous people tend to be more long-term in their approaches, whereas the Federal Government tends to think in terms of months rather than centuries. Nevertheless, she is aware of cases where the government was swayed toward the long-term. This gives her hope for the future. She also believes individuals can help in restoration and conservation by learning about the particular habitat they live in as well as its long-term history and act accordingly. 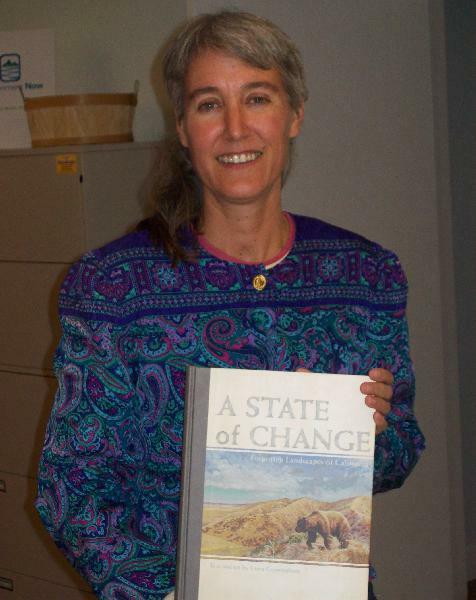 Her initial manuscript for "A State of Change" was quite long (she gestured about six inches with her fingers), but the publisher said the book needed to be shorter. Thus, she had to omit much of her work concerning deserts. (She herself lives in the Mojave Desert.) It is her hope that there will be a second volume of this book. The publisher also wanted to truncate her studies of native grasses, but Cunningham, recognizing widespread interest in his area, strongly advocated leaving it intact. Fortunately, she prevailed. During a q&a that followed her slide show, there was much talk of solar farms in deserts and their enormous potential to harm ecosystems. It was suggested that she might illustrate such areas--but project into the future rather than the past—to demonstrate this threat. Cunningham has already lobbied in Washington, D.C. for smarter implementation of solar power. Also, during the discussion, the author/artist/scientist emphasized the significance of landscape renderings and studies by contemporary artists. In the future, this art might help people understand nature in our time. Such art may someday even adorn museums, she suggested. Cunningham mentioned the possibility of a traveling exhibit of her art, noting that her paintings could fill up quite a bit of space. Her upcoming appearances can be found here: http://www.a-state-of-change.com/Classes.html and here: http://www.heydaybooks.com/. *She is currently doing additional illustrations of California in the ice age. The San Fernando Valley, not too long ago with a grizzly bear not very far up in the foothills of the San Gabriel Mountains. This artwork is copyright 2010 by Laura Cunningham and has been used with permission.